American Plastic Toy Pieces Gardener Set Just $13! You are here: Home / Great Deals / Amazon Deals / American Plastic Toy Pieces Gardener Set Just $13! Head over to Amazon and get the American Plastic Toy pieces Gardener Set for just $13! Shipping will be FREE with Amazon Prime or an order of $35 or more. Recommended Ages: 2 and up. 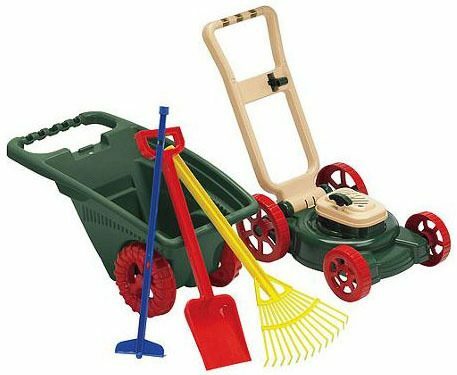 Set includes a lawn mower and a garden cart, plus a hoe, rake and shovel. Packaged in a colorful corrugated carton with a full color litho label. Age Group: 2 Years/3 to 4 Years. Dimensions: Overall Height – Top to Bottom: -21.5 Inches. Overall Width – Side to Side: -17.25 Inches. Overall Depth – Front to Back: -10 Inches. Overall Product Weight: -4 Pounds.